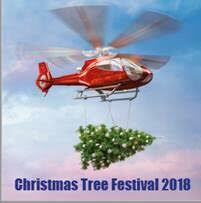 Our theme this year is “Symbols of Christmas” and we are raising money for London’s Air Ambulance. We are looking for people to sponsor and decorate a Christmas tree for the Festival. A list of suggested tree titles is on the notice board in the vestry corridor. Look and see if there is a title to suit you – or come up with one of your own. They range from carols to christingles, mince pies and sugar mice. Just be a little imaginative and creative and decorate an entertaining tree! We have a limit of 38 trees and so it is ‘first come first served’. Why not sponsor a tree as a family, or with friends as a group (just £60 for a 5ft tree)? We provide the tree and you decorate and light it. We are also planning a craft fair on the Saturday – further details can be obtained from Elizabeth Scharinger, Church Administrator (office@trinitywimbledon.org). We do urgently need more suggestions of possible sponsors for our trees. If you have any outside contacts who might be willing to sponsor please let us know as soon as possible. If everyone gave us the name of just one contact it would make an enormous difference to the success of the Festival. Get involved and make this another great event for Trinity and support London’s Air Ambulance. Make a note of the Festival dates now, sign up for a tree today, and start thinking about decorations for your tree! The more entertaining the better. For further information, and all offers of help, contact Catherine Paul (catherine.f.paul@btinternet.com).